When Body Snatcher enters the battlefield, you may discard a creature card. If you don't, remove Body Snatcher from the game. Vash13 Thank you for the compliment! davidlbd, that's not a bad replacement. I personally love Gonti just because of the interesting situations he can create, but Liliana is a great source of discard. 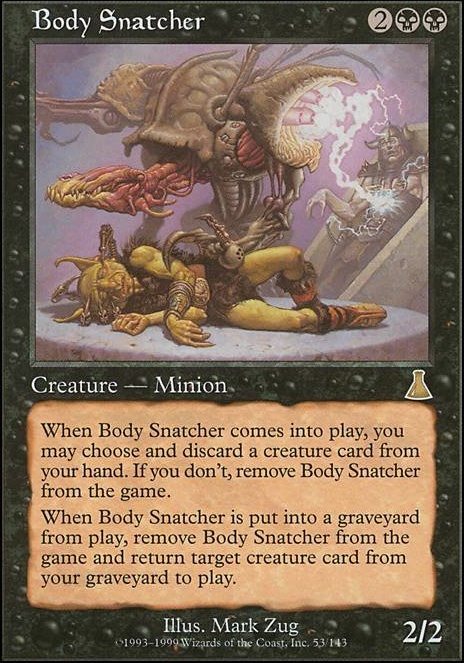 We also run Body Snatcher which can discard and recur all in one package. If you find you constantly have a full hand, you could also run Skirge Familiar to turn those discards into extra mana. For abusing Meren's ability multiple times over I would recommend considering cards like Animate Dead , Dance of the Dead , Necromancy , or Phyrexian Delver / Body Snatcher . Also more sac outlets wouldn't hurt as well such as Viscera Seer / Carrion Feeder . Dark Ritual / Culling the Weak also helps getting Meren online as soon as T2! Feel free to check out my deck list as well for some ideas! 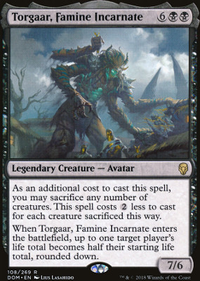 While I know your more creature heavy, there is good in using reanimation type cards like the cheap effect ones such as Animate Dead, Dance of the Dead, as well as Reanimate (Luckily it's getting reprinted in UMA so that $20 price tag doesn't stay for long). 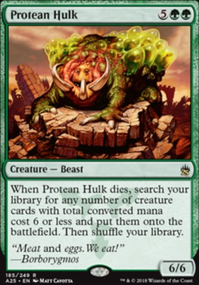 While this card may be broken, Protean Hulk does a lot for your build when you have to sac him to Vraska or Jarad, getting both value and efficiency. I can see there being loops with it going for infinite recursion, but that's if your all for going the combo route. 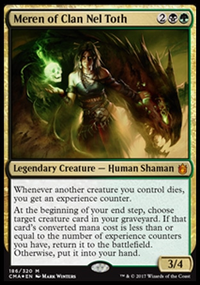 Some great cards to also run would be like Oversold Cemetery so you can keep a constant amount of creatures to be fodder and sac over and over again. With this in mind some recent cards like Vindictive Lich and Plaguecrafter get extremely fun! Hell's Caretaker is way too slow and there is a better option in Apprentice Necromancer. 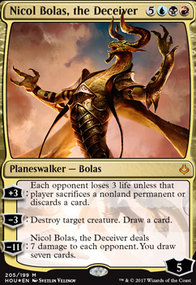 I'm also surprised you aren't running Living Death unless you run into a creature heavy meta than it's understandable. World Shaper is also one to think about as it is pure value, especially if you delve into a Dredge route as well. Hope that gives you some feedback and feel free to ask any questions or advice! I absolutely love Teysa, she is a blast to play as there are so many ways you can play her! Here might be a couple suggestions that may help. Contamination and Bitterblossom is a nasty way to shut down your opponents and if you have Teysa on the field the sac tokens provide you fodder for Teysa's ability, although the cards are quite on higher end side. Plaguecrafter is another recent addition that is a direct upgrade to Fleshbag Marauder. Mindblade Render is a great way to add in more card draw as we are quite limited in the Orzhov colors. Buried Alive is another great way to fill up your graveyard, and the direct upgrade Entomb is also great although quite pricey. 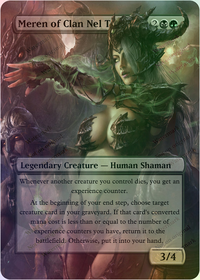 One cheap reanimation spell I would recommend would be Dance of the Dead and if you have the budget, Reanimate which is getting reprinted in Ultimate Masters, Necromancy is also a great one. Dread Return also has plenty of synergy with Teysa. Silence can really mess up people and has quickly becoming a staple in any deck build involving white. 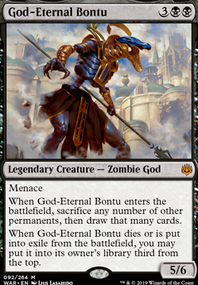 Withering Boon and Lapse of Certainty has been great LOL cards that people would never expect. Body Snatcher is also a double up on Karmic Guide that can lead to more combos.